Below are my talent recommendations for various situations along with an in-depth look into each talent choice. Final Verdict: Increase your Templar's Verdict by 20% and your Divine Storm by 10%. Great for singlet target and cleave fights. Execution Sentence: A hammer that deals its dmg after 7 sec and 20 sec cd, cd/dot gets reduced by haste. Currently this talent is pretty much useless, it only provides pure single target but the main reason it's bad is that it feels clucky to play with. Unless they buff this talent you should not pick this for any fight. Consecration: Does dmg to all enemies in the circle around you. This talent is mainly used for fights where you stand still and just pump aoe out constantly (3+ targets). Currently there are no fights in the game other then some mythic + and Botanist heroic where you stand still and aoe. Currently I would go for Final Verdict over anything, as it gives you great single target dmg with some cleave without having to use another global and lose the legendary cloak buff. The Fires of Justice: Reduces the cd of Crusader Strike by 1.0 sec and has a 15% chance to reduce your next holy spender by 1. This talent is most likely to be your best as it gives you the most Holy Power the fastest with the proc and with our current 4 set. Zeal: Replaces Crusader Strike, each time you use Zeal you get a stack that allows you to attack up to 1 additional target stacking up 3 times. Zeal deals more dmg than Crusader Strike, and has a longer cd on the charges, but it gives you great cleave opportunity. Mainly this talent is only used if you have the legendary ring or a fight where there is always something to cleave. You should sim your character to find out if this talent is worth it or not as it changes a lot depending on your gear. Greater Judgment: Makes your Judgment hit 2 additional targets and always crit on targets above 50% health. This talent is mainly for massive pulls in mythic+, it's hard to get this talent working on a raid boss, but I feel like they should rework this because no one really goes for it. If you have cloak/waist legendary and 4 set you should always go for The Fires of Justice as it gives you the most Holy Power to spend the fastest, BUT you should always sim your character to find out which one is best, Zeal or The Fires of Justice. Fist of Justice: Reduces the cd of your Hammer of Justice. After every Holy Power spender you use you can get 2 Hammers out in 1 swing with this talent, and other then that all it does is just reduce your stun by a bit. Repentance: Incapacitating the target for 1min and dealing 25% of its health over that 1min. Only works on demons, dragonkin, giants, humanoids, undead. Pretty much speaks for it self, if you have anything you need to cc like last phase of Gul'dan Mythic you should go for this. Blinding Light: Disorients all targets around you interrupting their casts and making them wander around for 6 sec if you don't attack them. Doesn't work on all enemies, but otherwise serves as a mass interrupt. I mainly go for Blinding Light here but go for whatever your raid/dungeon needs. Virtue's Blade: If Blade of Justice crits it deals 3 times the normal Damage. The only way I can see this talent being any good is if you have a ton of crit, like 40%, as the other choices are way to strong atm compared to this. Blade of Wrath: Auto attacks have a chance to reset your cd on Blade of Justice. Great for pure single target dmg and has a chance to give you a lot of Holy Power in a very short time, but it all comes down to procs. Divine Hammer: Replaces your Blade of Justice and deals holy dmg to all enemies around you. Currently the strongest in both aoe and single target, this talent deals constant aoe dmg. 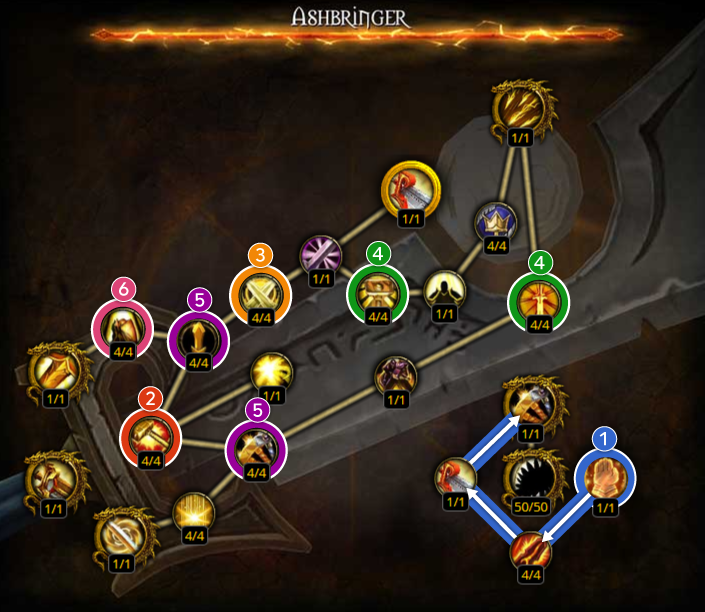 Atm everyone goes for Divine Hammer as it is the strongest talent right now. But it all comes down to sims, if you're going for pure single target you have to sim your character to see if it's worth going for Blade of Wrath or another talent, it's all gonna come down to how much haste/crit/vers you have. As for aoe I don't think anything has a chance to beat out Divine Hammer. Justicar's Vengeance: Uses 5 Holy Power to deal a massive attack and restore health equal to the dmg done, it also deals 100% additional dmg and healing to a stunned target. If you have the legendary cloak look away from this talent, right now there is no point in picking it, as it takes 5 holy power and it barely does more dmg than Templar's Verdict, so unless they buff this, don't take it. Eye for an Eye: Reduces physical dmg you take by 35% and it counterattacks enemies for a small amount of dmg. Lasts 10 sec. Great for almost any dungeon/raid, if both your tanks die you can pop this and take a few hits before you need to bubble. Also good if you need to tank an add or if the boss does an aoe ability that deals physical dmg. Word of Glory: Uses 3 Holy Power to heal up to 5 friendly targets within 15 yards. I would mainly go for this talent if your raid or your dungeon grp asks you for it. With wings on, 1 Word of Glory will heal up to 2m+ to 5 targets within 15 yards. It's great for fights like Helya where the melee is a little bit far away from healers at times. As I said, atm Justicar's Vengeance is just to weak to take for anything, so pick either Eye for an Eye or Word of Glory depending on what your raid/dungeon needs. Divine Intervention: If you were to die, Divine Shield will insta pop and heal you for 20% of your max health. It also reduces the cd on Divine Shield by 20%. This is the talent you mostly see everyone use cuz well, its an auto bubble. I mainly go for this early on in progression as in it allows me to not insta die if something goes wrong, and be able to push that extra dps to either make it to the next phase or see something new. Cavalier: Divine Steed now has 2 Charges. Really great for high movement fights. Judgment of Light: Judgment applies Judgment of Light to the target with 40 charges and anyone who attacks this will be healed for a very small amount. In 7.2 this now stacks with all paladins, so for the next raid you will most likely see everyone using this to help the healers a little bit. Again it comes down to what you need - do you need a 4 min bubble or a 5 min, or do you need to move around a lot, or are healers rly having a hard time. Pick what is needed of you. Divine Purpose: Holy Power consuming abilities have a chance to make your next Holy Power spender free. Could be good if you need instant dmg but atm it's just too weak compared to Crusade for a 2 min cd. Crusade: Replaces Avenging Wrath, increases your Dmg and haste by 3% for 20 sec and each holy power spent during it increases it by another 3%, stacking up to 15 times. Even with all the nerfs this talent is our best choice for any fight, it takes some time to learn how to open with this talent as it all changes depending on how many Crusade relics you have, but once you get used to it nothing beats this. Holy Wrath: Deals 200% of your missing health in holy dmg to 4 nearby enemies, up to 120% of your max health. Who wants to be low health in any raid/dungeon fight, even if you got this spell off it still deals almost no dmg. I feel like unless they change this talent to something else entirely or buff it A LOT it's gonna continue to be a dead talent. As of Right now Crusade is just by far the best talent here, mainly because the 2 other choices are just too weak to even compare them to it. On how to play with Crusade, check out my opener guide section. 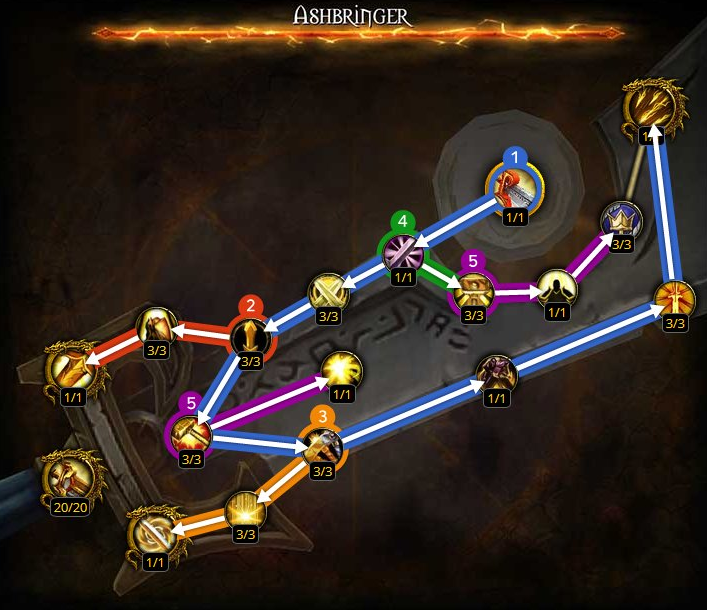 7.2 New Artifact tree path. Pictures Taken from paladin discord. At 4 pick Divine Storm before going for Templar's Verdict dmg as most things you will do in the game need cleave/aoe rather then a tiny bit single target dmg increase. At 5 go for Judgment first over Crusader Strike crit as it is just the best. The Crusade (Wrath of the Ashbringer) relic is by far the best with Divine Hammer (Blade of Justice) coming in 2nd, Divine Storm is good but it's only useful on cleave/aoe fights and for most bosses you only do it for a short amount of the time.